Tom DuQuesnoy has been causing a stir on the European scene for quite a while. A definite target for the UFC, the French 22-year-old is currently under the tutelage of world-renowned coaches Greg Jackson and Mike Winkeljohn in Albuquerque. Jackson even traveled to Birmingham last weekend to corner his student at BAMMA 25, which points to the promise that the youngster has. 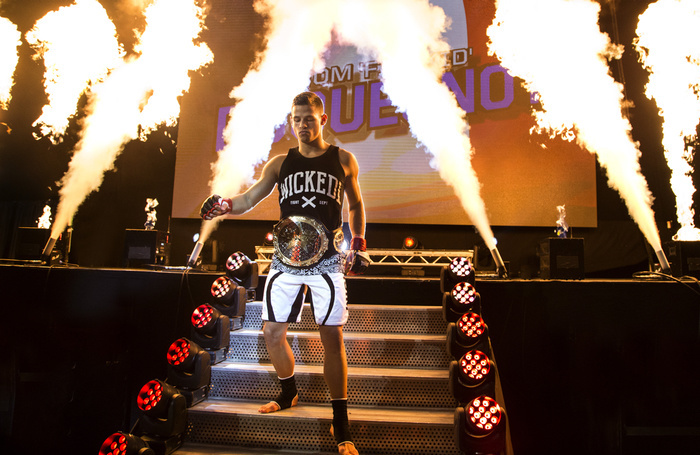 At BAMMA 25, ‘Firekid’ reminded everyone what all the fuss is about by adding the promotion’s bantamweight title to his trophy cabinet with stunning first round elbow finish of Shay Walsh. Just his second fight at the 135 lbs weight class under the BAMMA banner, DuQuesnoy already holds the promotion’s featherweight title. Since his triangle choke finish of Teddy Violet to establish himself at the top of BAMMA’s featherweight pile in April 2014, the conversations about the stunning striker have been centered around when he will be signed by one of the world’s big promotions. Yet, DuQuesnoy’s balanced temperament has seen him stress that he is no rush. The French standout highlighted that he would eventually move down to bantamweight, and while some criticized his decision based on his success at the higher weight class, in his two fights since dropping down he has proved more potent than ever before. Even after his spectacular knockout of Walsh last weekend, DuQuesnoy has stated that he wants another fight under the BAMMA banner, which will be music to CEO David Green’s ears. The prospect has called for a meeting with BAMMA’s Lonsdale bantamweight champion, Alan Philpott, and the Northern Irish fighter has accepted the challenge. Philpott believes that BAMMA’s return date in Dublin on September 10 will be an ideal date for the contest, but as of yet it has not been confirmed. While DuQuesnoy is very well-rounded, his ability in the striking realms set him apart from the rest of the field. Training since the age of twelve in boxing, Thai boxing, and wrestling, he transitioned seamlessly into mixed martial arts when he eventually made his pro debut at 18 years of age. Going 4-0 before eventually tasting defeat for the first and only time against Amirkhani, when he reemerged he began to collect belts on the continent. Collecting two Battle for Belgium titles and another for Killacam before BAMMA came knocking, his second round TKO victory James Saville in his debut was rewarded with a title shot. Showcasing a grappling pedigree that was an unknown commodity in his arsenal up to that point, Duquesnoy was the toast of the promotion following his second round triangle win over Violet. In his first title defense, Duquesnoy cracked British veteran Ashleigh Grimshaw with an inside low kick right to the meat and two veg in their first exchange, which led to the fight being determined a no contest. Krzysztof Klaczek may have given Duquesnoy one of his hardest tests to date when they met after in his next defense. The Polish featherweight ground out the first two rounds in top position against the champion. Despite losing the first two rounds, DuQuesnoy never lost hope and came out and blitzed his counterpart in the final round to claim a TKO win. The bottles that rained into the cage after his split decision win over Brendan Loughnane in Dublin last year might have been the writing on the wall for the French sensation to drop down to bantamweight. An incredibly close fight, the boos that rang around the 3 Arena showed that a lot of people didn’t agree with the judges decision. Ever since making the move to bantamweight in February, DuQuesnoy looks even more lethal. It could be the fact that his opponents don’t have the same weight behind their punches, but ‘Firekid’ looks even more willing to engage since dropping down. Against Damian ‘The Rage’ Rooney, it looked like his lack of caution cost him the fight when the Derry man caught him and momentarily dropped him. Yet, finishing the bout in the first round, DuQuesnoy’s pressure and volume proved too much for the Irish veteran. Former bantamweight champion, Walsh, was on the end of a similar display of volume last weekend and a single elbow from the clinch separated him from his sense a little over a minute into their bout. The appeal of Duquesnoy doesn’t just lie in his physical ability either, but the zen-like approach he has to contests is equally intriguing. The patience he has shown given his international prospect status has not gone to his head as proven by his willingness to stay under the BAMMA banner. In an MMA universe full of trash talking and one-liners, DuQuesnoy explained the great admiration he has for all of his opponents when asked if he felt superior to the fighters he faces after his big win last weekend.